Our usual Field Day site is at the Icebreaker Mackinaw Maritime Museum Ship. The picture above says it all. 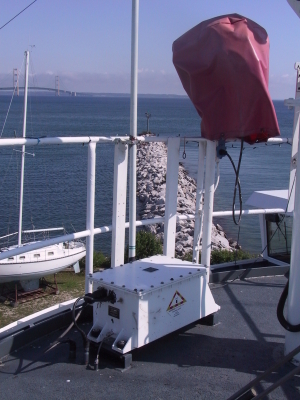 This view is from the Starboard side of the Mackinaw looking across the CCECPSCO communications trailer toward Mackinaw Island. Note however that the 2014 Field Day activities are being held in Gaylord at University Center in participation with Otsego County RACES. Another view of the usual CCECPSCO Field Day site. Like we say about antennas, when it comes to props, you can't have one that's too big--that is unless your boat can't stay afloat with it. 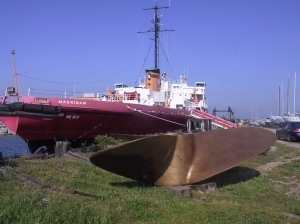 In this case, the 5,252 ton Mackinaw had no problem both supporting and turning these 14 foot propellers at the stern and a smaller 12 foot propeller at the bow. Somewhat more subtle in this picture is the 160 through 40 Meter Alpha Delta dipole above the ship's Port side. 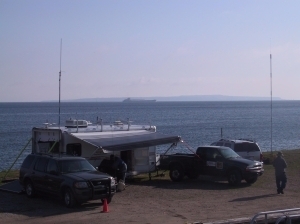 If you look just above the "I" in Mackinaw, you can see the 10 foot support holding the aft end of the dipole. If you're not Broadband challenged (like many of us in Northern Michigan), you can click on the High Res link and should be able to follow the support rope part of the way up to the antenna, which isn't too visible in this picture. Can You See the UHF Repeater Antenna? 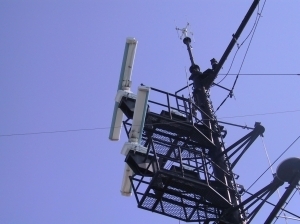 While we're not exactly sure which antenna our VHF repeater is tied to (it's one of the VHF marine antennas up there somewhere) we're sure the vertical on the railing to the right of the upper RADAR is connected to our UHF repeater. That was actually one of our projects Saturday morning Field Day weekend. Thanks to a friend from the Coast Guard, who is permitted to climb the mast (they only let us walk the plank), we were able to move the repeater's antenna from a short mast just above the radio room to this higher location. Those two RADAR antennas, by the way, are no longer functional since much of the electronics was removed when the ship was retired. The RDF antenna at the top, however, still works, which is kind of surprising considering it's one of the more likely things on the ship to take a lightning strike. Don't ask me why a picture of the two Ham repeaters on board the Mackinaw are included on a page about Field Day. I suppose a good excuse is that we moved the UHF antenna to the higher location that weekend and we wanted to show you where the other end of the cable goes. Unfortunately, you can't see that, because the UHF duplexer, which is sitting on top of the repeaters, is hidden inside the rack. In fact, we couldn't see it either because the rack is too close to the wall and the VHF duplexer (also not visible) is sitting on the floor next to the rack making it even more difficult to get back there. We assume the cable ended up in the right connection because the repeater seems to work. Perhaps someday we'll know for sure. In any case, we don't have another picture of the repeaters in our Web site--so here they are. The repeaters, Motorola Desktrac's, were cheap on E-Bay but have to be the worst repeaters I've every worked with (almost). These things are marginally stable in frequency but do manage to stay close enough to be usable and the COR output was a real pain to work with. 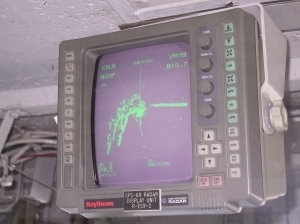 The blank panel below the repeaters is the RLC-2 controller and the unit above is one of the many UPS's left on this ship. This one is providing some amount of backup power in case the mains power to the ship gets interrupted. By the way, this is in the "Crypto" room and is where the ship's HF radios were located. 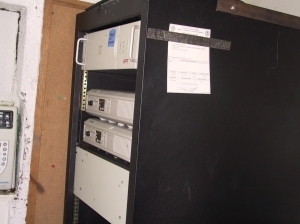 The rack with the repeaters was the rack that held all of the data and crypto equipment. Needless to say, that equipment was not left by the Coast Guard. Here's the only currently working RADAR on board the Mackinaw. It's located in the Pilothouse and was another Saturday project that weekend. This unit started blowing fuses last fall and was pulled for some work. Saturday, we reinstalled it, spun the antenna a few times to make sure it would do that, and powered it back up. Gratefully, it came back to life. Helping out with some of the other communications, navigation, and electrical equipment is just another way the CCECPSO has been helping the Museum organization. What you're seeing on the RADAR display is Mackinaw City in the center, the shoreline to the South East of the city toward the lower-left, and the Mackinac Bridge (the long straight line) to the right. If you look at the lower-left of the RADAR display you can see it's only set for a three mile radius, which is why you can't see the other end of the bridge and the UP at the right. If you're wondering why the ship and city are spelled with a "w" at the end and the bridge with a "c" at the end, it's because the area was populated by both English and French and they both had their way of spelling the name derived from "mish-inni-maki-nong". One of the antennas used for Field Day was this HF vertical. Sitting at its base is a Sunair automatic antenna coupler used to match the antenna to whatever frequency on which the attached RT-9000 radio may be set. This is one of the antennas that was on the ship at the time of the ship's retirement. The Coast Guard cut both the transmission line and control cable to this coupler, as well as the lines to the matching antenna and coupler on the port side. This would be the Starboard antenna and coupler. You can tell because the ship is docked heading West toward the center of Mackinaw City, the Mackinac Bridge is North of Mackinaw City, and the bridge is visible in this picture (make sense?). The break wall in the picture is the one protecting the East side of the current public marina. You may now ask why we were using a permanently installed antenna for Field Day. The reason is that we were running class "F" as an EOC. The ship, which has been used in emergency exercises, is classified as an established EOC (well, arguably since it was sort of, kind of, designated that during the exercise). Not to worry, we hardly represent competition to any other Field Day stations since we spent so much time working on things, eating, sleeping, and of course taking pictures--not to mention the continuing noise problems from things on the ship (which is still something to work on). Looking off to the Port (get the pun?) 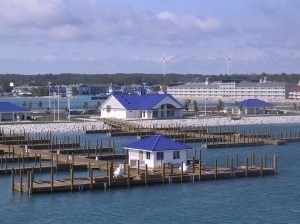 we get a view of the new Mackinaw City marina nearing completion. This is going to make a beautiful addition to the Mackinaw City skyline and will accommodate considerably more boats than the current marina. This picture doesn't show the entire expanse of the new marina because I wasn't using my wide-angle lense. Believe me though, it's pretty big and represents yet another reason why busting our back ends to rack up a massive contest score was not the most important thing on our minds. 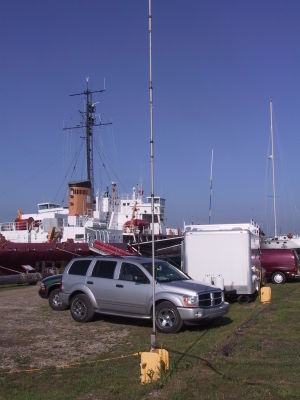 As for actual Field Day operations, we had three stations up and running--two on the ship and the GOTA station in the trailer. I haven't compiled the final results yet, but it appears we made somewhere North of 400 contacts. It wasn't high-pressure contesting, but it was a fine weekend nonetheless. Not only did we setup and establish communications, have some good food, and do a bunch of talking, but we also got a few things done on the ship to help our hosts. Speaking of which, we all want to thank the Icebreaker Mackinaw Maritime Museum Ship organization for letting us spend the weekend on, in, and around this wonder of 1940's engineering. Truly, a Northern Michigan way to do Field Day!